Fugro has been awarded contracts by Ørsted to undertake geotechnical investigations at two large-scale offshore wind development sites. Ørsted is pursuing the development of these two new projects – Bay State Wind, located 15 miles off the coast of Martha’s Vineyard, Massachusetts and Ocean Wind, 10 miles off the New Jersey coast – to bring wind energy to American consumers and businesses. 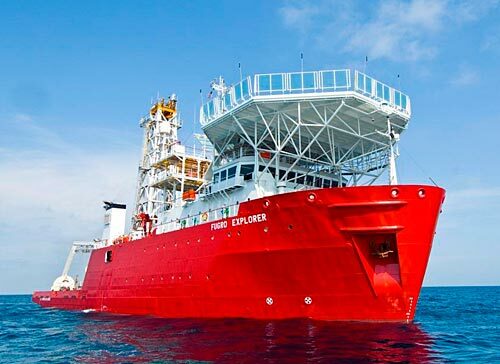 The marine site characterisation at both sites involves highly specialised sampling and in situ testing which Fugro will perform from its dedicated DP2 geotechnical drillship, Fugro Explorer. For laboratory testing and reporting servicesFugro will draw on its expertise from Norfolk, VA and Houston, TX in the USA as well as Wallingford (UK) and Nootdorp (Netherlands), with the objective of providing fully integrated deliverables. Prior to the contract awards Fugro carried out geoconsulting desktop studies and geotechnical ground truthing for Ørsted. Ed Saade, President of Fugro USA states that the two contracts provide an opportunity to expand on the successful relationship Fugro has with Ørsted in Europe. “We strongly support the growing offshore wind development activity here in the USA. It fits directly with our overall strategy for coastal zone management activity and coordination between industry, government and academia,” he adds. Site investigations are due to commence at the end of November and are expected to continue for three months. The projects will be conducted under Fugro’s QHSSE management system, which is in accordance with industry leading QHSSE and operational standards.